"Packed with facts, colorful photographs, and personal narratives from the author...which adds flavor and authenticity to the text." 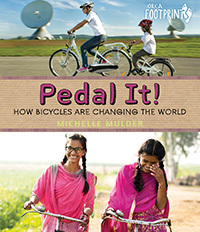 "This very cool tome for inquisitive children shares a brief history of the bicycle, with interesting facts...From Nepal to Kenya and many countries in between, bicycles are enabling people to run home-based businesses and give them pedal power!" "Opens the door to so many interesting discussions...Filled with beautiful stories and pictures about life in various countries. Children will be amazed by how much a person can carry while bicycling!" 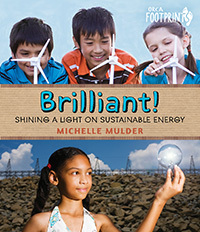 "An excellent book for upper elementary and middle school students. The history of bicycling and the importance of bicycles in emerging nations are clearly presented. The pictures and drawings are clear. The book contains "Bike Facts," extra information which might intrigue the reader. The author also shows many ways that bicycles are used which might not have occurred to the reader. 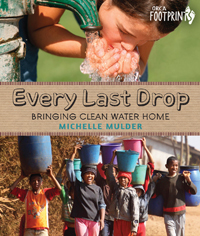 The book contains an excellent resource list and a very good index." 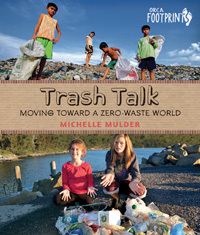 "The introduction sets a personal tone that Mulder returns to throughout the book in the many sidebars concerning her experiences and those of her friends and family...The quality of the color photographs is quite good...The book's international focus is valuable, and students will find material here that is both interesting and potentially useful for reports." "Visually appealing...This book would be a great addition to an elementary library as an excellent resource for students learning about the history of cycling and the benefits of using bicycles to man and the environment." "Mulder's evolutionary survey of the bicycle is, like the subject in question, a piece of many parts: a cultural history, a course in mechanics, a soupçon of physics, a spotlight on economic class and a springboard for innovation. In a bouncy, friendly tone, she proceeds roughly chronologically, but has no hesitation to follow a thread or a whim, often in colorful boxed asides...Mulder twines the mechanics of bicycles with cultural phenomenon, the environmental benefits of cycling and even the change in women's fashions...A smart, tangy history of our two-wheeled friend." "Mulder is a bike enthusiast who has written a hugely entertaining and informative nonfiction book about bicycles...Hang onto your handlebars! Pedal It! is a must-read for kids and adults alike. Now go dust off your bike!"